What to do when you get your new Vacuum Chamber Machine! A box of characters for your heat sealing bar for coding your bags. An extra gasket for your lid. 3. We now sell both 220 and 110 V.A.C. vacuum sealers. Make sure you know which you have. The way to be sure is to look on the plate on the machine. To really be sure, check the plate on the pump motor! 110 V.A.C. units should be ready to go as is. Go to Step 4. Lift the lid - the spring load will catch and hold up the lid. First, let's set the vacuum time. Push the first green button on the left and the vacuum time will show in the led window. Use the increase/decrease buttons to set it at 28 seconds. You can fine tune it later. 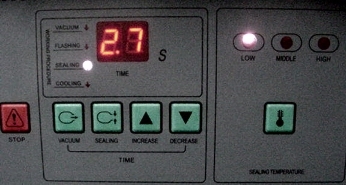 Set the heat on the sealer bar by pushing the button on the far right until the low indicator is lit. Now push the sealer button (the second button from the left) and set the sealer time(not the flashing time) to 2.7 seconds or so with the increase/decrease buttons. (Too long will burn out the heat strip and it will have to be replaced.) You want the bag to seal securely and no more. Quick, repetitious sealing of bags will require you to set the time back even more because the sealing strip will not have time to cool down between sealings. Put something in a bag and place it inside the chamber with the open end on the sealer bar and under the holder wire. Push down the lid to start the vacuum and hold it until the vacuum holds the lid down. Watch the vacuum gauge and note the time that the gauge no longer moves lower. Add 2 seconds and set your vacuum time to that time the next cycle. 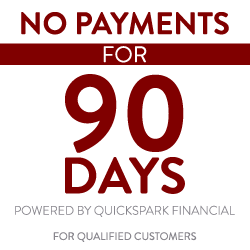 Get ready to save Money and Increase Sales! After years of hard use, your dual chamber vacuum sealer's lid may need adjustment. It's Easy! Do this! 1, Loose the screws #1 and the set screws beside it and nuts #2 on all four arms. 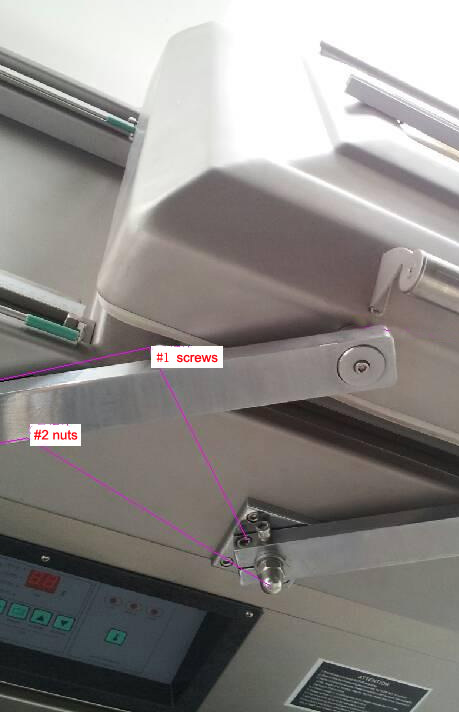 2, Push down the lid, when the vacuum gauge points to yellow or green range, cut off the power and keep the lid sealed on the chamber, then tighten the #1 screws and set screws and #2 nuts. Then turn on the power, push the stop button to release the air. There are split bolts on each end of the sealer assembly. Those are the same bolts that the wires connect to. You put the heat strip into the split so that you can wind up and tighten the heat strip after you have replaced the insulating fabric. Oh, yes, replacing the heat strip on the dual chamber machine looks very difficult but it is not. There is one bolt that holds the heat assembly up under the lid. Remove that bolt and it comes down so that you can simply detach the wires on each end and repair the heat strip. After years of hard use, your single chamber vacuum sealer's lid may need adjustment. It's Easy! Do this! If your vacuum chamber doesn't seem to vacuum as good as you remember, it could be one of two things. First, check the level of oil in the sightglass and the color. If it is a creamy coffee color, it needs replacing. (available on the web page for vacuum sealers) If not and the level is OK, the lid may not be sealing completely. This sometimes happens at the hinge to the right rear. See if you can slide a card between the gasket and the top of the metal chamber when the machine is operating. If there is a gap, you will have to remove the rear panel to get to it. You will find a hole in the lower part of the rounded hinge. You will need a long metric allen wrench. The set screw is way up in there and you will need to tighten it a little, until the lid seals. That's it!